Okay, I'm getting excited about the upcoming trip in May. I have a job to do in connection with it and started this afternoon. I'm making little Pocket Itineraries for the participants in Jeanne Mills Tours' "Fun in Southwest France." Jeanne originated these pocket itineraries in which she gathered together trip specifics she needed as leader. A few fellow travellers admired my little book, so Jeanne and I arranged for me to make them for the whole group. I've done it several times now. It's handmade -- that is to say, labor intensive. I built the format on an ancient word processor. (I adore Lotus Word Pro.) 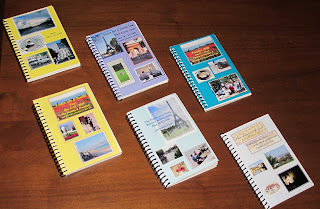 Then I print, collate and cut pages, cobble together photo covers, then take them to Staples for spiral binding. I'm running on a tighter-than-usual schedule to produce it this time, as I need to have everything printed and ready for binding before March 4. Jeanne will be holding a pre-trip orientation the week after that where she hopes to pass out the PI's. Meanwhile, Brother-in-Law called awhile ago to report that a spring on the garage door broke at the Mountain House and the door is unliftable. Do I know a guy? Well, yeah, I know a company, because a few years ago I got a super garage door opener and would BIL be interested in getting a full-fledged opener rather than a mere spring? Nice blue lights on the controller. Blue lights just lure me right in. My retiring Sony Vaio has beautiful blue lights behind its logo and I'll miss that. I talked to the head cable honcho today to find out what I, or they, need to know when I install my magical new router. Those green lights were flashing in ways they shouldn't during this last week. The problem was ahead of the local cable Internet company, where it's out of their control.. It's still frustrating when Internet doesn't work, but I can't grumble at the local guys. Bring on some travels. I'm ready. Or at least I should start walk to get in shape. Ugh! I remember the book you made for Essoyes. You are so creative; what a lovely souvenir of the trip as well. I must remember this for future trips.